How’s your weekend going? 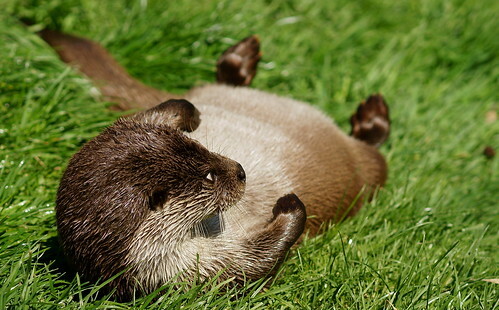 Today’s open thread is hosted by “Emmy” the otter, courtesy of Peter G Trimming who shared this photo on flickr. Click through for more. The rain outside today makes me envy Emmy rolling in the sunshine on that lush green grass even more than I normally would. I’ve been quieter than usual lately, and it’s likely to continue for a while, so I’ve written up why. As promised, in the inter-otter days I handed my PhD thesis in for examination! I am more nervous about the examination than most PhD students seem to confess to, and since my examiners may well be able to use the Internet too (hi!) I don’t want to talk about it in detail yet. But, having it handed it is definitely better than the preceding time. I saw Zoë Keating (recently a Hoyden Sunday musician) perform in Katoomba last night. That was pretty great, also kind of intense to haul my family up there 48 hours after handing in. Pro tip: Sydney traffic makes getting to Katoomba by 7 on a Friday quite a challenge. Yay Mary. How long before we may call you Dr Mary? Great job, Mary. I hope you found out-of-traffic time to give yourself a suitable reward (big slug of red wine is what I would be looking for, but each to her own). Re. your viva: there will probably never be a similar opportunity for you to discuss in detail the topic you know more about than anyone, with well-informed people who have read your work – lap it up! Tigtog, sending you recuperative vibes. Conversation in our house. Husband arrives home with new book about Reepicheep, the valiant mouse in the Narnia books. Child: Look, Reepicheep has the same sword as Captain Boots. I mean Puss-in-Boots. Husband: You’re right. Imagine if Reepicheep and Puss-in-Boots had a duel. Cool; who do you think would win? Me: I wonder if there’s any slash fiction. Husband: You should write some. Child: You need to let me talk now. Somehow I feel this sums up quite a bit about all of us. Mindy: there are multiple outcomes of a PhD examination, including needing to re-enrol and very substantially revise, and it is possible to fail them, so, I can’t make any promises about when or if I can use the title. I believe I will know the outcome of the initial examination in about three months, but it’s usual in my field for at least some revisions to be needed. orlando: we don’t actually do a viva at my university, only written correspondence with the examiners. I think this is the usual case in Australia (maybe there are exceptions at some? ), actually, due to the expense of flying examiners in for a viva. Congratulations from me too, Mary. Congrats to Mary on submitting the thesis – hurrah! I’ve been moderately fascinated by the weekend coverage of HM’s Diamond Jubilee in London – I’m a dedicated republican who disapproves of royalty on principle, but I do admire the attention to detail in the execution of BritainThe Establishment’s strategic deployments of pomp and pageantry. Using the river this time was a stroke of genius. Thanks Helen, Rayedish, SunlessNick, tigtog! Sprog the Younger has her squee-setting dialed up to maximum – we just found her a pair of gorgeous not-quite-steampunk* goggles at a shop in Newtown.